Pei, S. W., Niu, D. W., Guan, Y., Nian, X. M., Yi, M. J., Ma, N., Li, X. L., Mohamed Sahnouni. 2015. Middle Pleistocene hominin occupation in the Danjiangkou Reservoir Region, Central China: studies of formation processes and stone technology of Maling 2A site. Journal of Archaeological Science, 53: 391－407. 贾真秀，张兴龙，裴树文*. 2015. 泥河湾盆地西白马营旧石器遗址新材料. 人类学学报，34(3): 299－306. 卫奇，裴树文，冯兴无，敖 红，贾真秀. 2015.泥河湾盆地上沙嘴石制品. 人类学学报，34(2): 139－148. 仪明洁，高星，王惠民，裴树文，陈福友. 水洞沟第12 地点2007 年出土石核研究. 人类学学报，34(2): 166－179. Liu, W., Martinón-Torres, M., Cai, Y. J., Xing, S., Tong, H. W., Pei, S. W., 1, Sier, M. J., Wu, X. H., Edwards, L., Cheng, H., LI, Y. Y., Yang, X. X., Bermúdez de Castro, J. M., Wu, X. J., 2015. The earliest unequivocally modern humans in southern China. Nature, 526, 696–699. Pei, S.W., Niu, D.W., Guan, Y., Nian, X.M., Kuman, K., Bae, C.J., Gao, X., 2014. The earliest Late Paleolithic in North China: Site formation processes at Shuidonggou Locality 7. Quaternary International, http://dx.doi.org/10.1016/j.quaint.2014.03.052. 裴树文，牛东伟，高 星，陈福友，冯兴无，张双权，张 乐，张晓凌，马 宁，彭 菲，周振宇，关 莹，王惠民. 2014. 宁夏水洞沟遗址第7地点发掘报告. 人类学学报，33(1): 1－16. 裴树文. 2014. 旧石器时代石制品室内观测项目探讨. 见：董为主编，第十四届中国古脊椎动物学学术年会论文集. 北京: 海洋出版社, 181－194. 牛东伟，裴树文*，仪明洁，马宁. 2014. 丹江口库区贾湾1号地点发现的石制品. 人类学学报，33(2): 149－161. Pei, S.W., Gao, X., Wu, X.Z., Li, X.L., Bae, C.J., 2013. Middle to Late Pleistocene homimin occupation in the Three Gorges region, South China. Quaternary International, 175: 237－252. Li, F., Gao, X., Chen, F. Y., Pei, S. W., Zhang, Y., Zhang, X. L., Liu, D. C., Zhang, S. Q., Guan, Y., Wang, H. M., Kuhn, S. L., 2013. 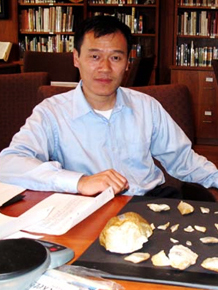 The development of Upper Palaeolithic China: new results from the Shuidonggou site. Antiquity, 87: 368－383. Yi, M. J., Barton, L., Morgan, C., Liu, D. C., Chen, F. Y., Zhang, Y., Pei, S.W., Guan, Y., Wang, H. M., Gao, X., Bettinger, R. L., 2013. Microblade technology and the rise of serial specialists in north-central China. Journal of Anthropological Archaeology, 32: 212－223. 卫奇，裴树文. 2013. 石片研究. 人类学学报，32(4): 454－469. Pei, S.W., Gao, X., Wang, H.M., Kuman, K., Bae, C.J., Chen, F.Y., Guan, Y., Zhang, X.L., Peng, F., Li, X.L., 2012. The Shuidonggou site complex: new excavations and implications for the earliest Late Paleolithic in North China. Journal of Archaeological Science, 39:3610 －3626. Guan, Y., Gao, X., Li, F., Pei, S.W., Chen, F.Y., Zhou, Z.Y., 2012. Modern human behavior during the late stage of MIS3 and the Broad Spectrum Revolution: evidence from Shuidonggou Late Paleolithic site. Chinese Science Bulletin, 57(4):379－386. Ao, H., An, Z.S., Dekkers, M.J., Wei, Q., Pei, S.W., Zhao, H., Zhao, H.L., Xiao, G.Q., Qiang, X.K., Wu, D.C., Chang, H., 2012. High-resolution record of geomagnetic excursions in the Matuyama chron constrains the ages of the Feiliang and Lanpo Paleolithic sites in the Nihewan Basin, North China. Geochemistry Geophysics Geosystems, 13, Q08017, doi:10.1029/2012GC004095. 牛东伟, 马宁, 裴树文*, 彭菲. 2012. 丹江口库区宋湾旧石器地点发掘报告. 人类学学报, 31(1):11－23. 李潇丽，武仙竹，裴树文. 2012. 湖北郧西白龙洞洞穴发育与古人类生存环境探讨. 第四纪研究，32(2): 199－208. 牛东伟，彭菲，裴树文，马宁. 2012. 丹江口水库淹没区白渡滩旧石器地点. 见：董为主编，第十三届中国古脊椎动物学学术年会论文集. 北京：海洋出版社，171－178. Guan. Y., Gao, X., Wang, H. M., Chen, F. Y., Pei, S. W., Zhang, X. L., Zhou, Z. Y., 2011. Spatial analysis of intra-site use at a Late Paleolithic site at Shuidonggou, Northwest China. Chinese Science Bulletin, 56(32): 3457－3463. 马宁，裴树文，高星. 2011. 许家窑遗址74093地点1977年出土石制品研究. 人类学学报，30(3): 275－288. 刘德成，高星，王旭龙，张淑芹，裴树文，陈福友. 2011. 宁夏银川水洞沟遗址2号地点晚更新世晚期孢粉记录的古环境. 古地理学报，13(4): 467－472. Pei, S. W., Gao, X., Chen, F. Y., Feng, X. W., Dennell, R., 2010. Lithic assemblage from the Jingshuiwan Paleolithic site of the early Late Pleistocene in the Three Gorges, China. Quaternary International, 211: 66－74. 裴树文，马宁，李潇丽. 2010. 泥河湾盆地东端2007年新发现的旧石器地点. 人类学学报, 29(1): 33－43. 裴树文，高星，许春华，杨年友，黄再铭，梅惠杰，关莹，马宁，仪明洁. 2010. 湖北建始高坪洞穴调查及其试掘简报.人类学学报, 29(4): 383－394. Liu, W., Wu, X. Z., Pei, S. W., Wu, X. J., Norton, C. J., 2010. Huanglong Cave: A Late Pleistocene human fossil site in Hubei Province, China. Quaternary International, 211: 29－41. 李潇丽, 裴树文, 马宁, 刘德成, 彭菲. 2010. 泥河湾盆地东谷坨遗址剖面易溶盐沉积及其环境意义. 古地理学报，12(3): 307－314. 马宁，裴树文*，彭菲，高星，李国洪. 2009. 三峡库区池坝岭旧石器遗址2007年发掘简报. 人类学学报, 28(3): 262－275. 彭菲，裴树文*，马宁，高星，李国洪. 2009. 三峡库区冉家路口旧石器遗址2007年发掘报告. 人类学学报, 28(2): 130－146. 武仙竹, 裴树文* , 吴秀杰, 屈胜明, 陈明惠, 胡勤, 刘武. 2009. 湖北郧西白龙洞古人类遗址初步研究. 人类学学报，28(1): 1－15. Liu, W., Wu, X. Z., Li, Y. Y., Deng, C. L., Wu, X. J., Pei, S. W., 2009. Evidence of fire use of late Pleistocene humans from the Huanglong Cave, Hubei Province, China. Chinese Science Bulletin, 54(2): 256－264. Wu, X. Z., Wang, Y. F., Pei, S. W., Wu, X. J., 2009. Virtual three dimensions reconstruction and isoline analysis of human marks on the surface of animal fossils. Chinese Science Bulletin, 54(9): 1564－1569. 武仙竹, 裴树文, 邹后曦, 侯江, 王运辅. 2009. 中国三峡地区人类化石的发现与研究. 考古，(3): 241－248. 裴树文，关莹，高星. 2008. 丹江口库区彭家河旧石器遗址发掘简报. 人类学学报, 27(2): 95－110. 裴树文，武仙竹，吴秀杰. 2008. 湖北郧西黄龙洞古人类石器技术与生存行为探讨. 第四纪研究, 28(6): 1007－1013. 武仙竹, 李禹阶, 裴树文, 吴秀杰. 2008. 湖北郧西白龙洞遗址骨化石表面痕迹研究. 第四纪研究，28(6): 1023－1033. 刘德成, 陈福友, 张晓凌, 裴树文, 高星, 夏正楷. 2008. 水洞沟12 号地点的古环境研究. 人类学学报，27(4): 295－303. 裴树文，陈福友，张乐，曹明明，黄鑫，高星. 2007. 百色六怀山旧石器遗址发掘简报. 人类学学报, 26(1): 1－15. 王惠民, 裴树文, 马晓玲, 冯兴无. 2007. 水洞沟遗址第3、4、5 地点发掘简报. 人类学学报，26(3): 206－221. 武仙竹, 裴树文, 吴秀杰, 刘武. 2007. 郧西人遗址洞穴发育与埋藏环境初步观察. 第四纪研究，27(3): 444－452. 武仙竹, 吴秀杰, 陈明惠, 屈胜明, 裴树文, 刘武. 2007. 湖北郧西黄龙洞古人类遗址2006 年发掘报告. 人类学学报, 26(3): 193－205. 裴树文，宋国定. 2006. 西峡旧石器考古调查简报. 人类学学报，25(4): 323－331. 裴树文，高星，冯兴无，陈福友. 2006. 三峡地区更新世人类适应生存方式. 第四纪研究， 26(4): 534－542. 高星，裴树文. 2006. 中国古人类石器技术与生存模式的考古学阐释. 第四纪研究, 26(4): 504－513. 刘武, 高星, 裴树文, 武仙竹, 黄万波. 鄂西-三峡地区的古人类资源及相关研究进展.第四纪研究, 26(4): 514－521. 裴树文，卫奇，冯兴无，陈福友，高星，朱松林，吴天清，李国洪. 2005. 高家镇遗址1998年出土的石制品. 人类学学报, 24(2): 104－120. 裴树文，陈福友，冯兴无，高星，卫奇，李国洪. 2004. 三峡地区枣子坪旧石器遗址. 人类学学报, 23(3): 200－212. 裴树文，冯兴无，陈福友，高星. 2004. 三峡地区中更新世晚期至晚更新世早期人类的适应生存方式. 人类学学报, 23（增刊）, 162－173. 裴树文，冯兴无，陈福友，高星，张文卿. 2004. 三峡井水湾旧石器遗址的自然环境. 海洋地质与第四纪地质，24(4): 109－114. 裴树文. 2004. 三峡地区河流阶地的成因时代与人类活动. 见：董为主编，第九届中国古脊椎动物学学术年会论文集. 北京：海洋出版社，263－274. 高星, 裴树文, 王惠民, 钟侃. 2004. 宁夏旧石器考古调查报告. 人类学学报, 23(4): 307－325. 陈福友, 高星, 裴树文, 冯兴无, 卫奇, 朱松林, 李国洪, 吴天清. 2004. 冉家路口旧石器遗址初步研究. 人类学学报, 23(4): 292－306. 冯兴无，高星，裴树文，陈福友，李国洪. 2004. 三峡库区和平村石器遗址. 人类学学报, 23（增刊）, 179－187. 裴树文，高星，冯兴无，陈福友，卫奇，朱松林，李国洪，吴天清. 2003. 井水湾旧石器遗址初步研究. 人类学学报, 22(4): 261－278. 冯兴无，裴树文，陈福友. 2003. 烟墩堡遗址研究. 人类学学报，22(3): 177－191. Pei, S. W., Hou, Y. M., 2002. Preliminary Study on Raw Materials Exploitation at Donggutuo Site, Nihewan Basin, North China. Acta Anthropologica Sinica, 2002, (suplement): 53－66. 邱占祥，卫奇，裴树文,陈哲英. 2002. 山西天镇后裂爪兽（哺乳动物刚，蹄兔目）化石初步报道. 古脊椎动物学报，40(2): 146－160. 裴树文. 2001. 东谷坨遗址石制品原料利用浅析. 人类学学报, 20(4): 271－281. 裴树文. 2001. 石制品原料的分类命名及相关问题讨论.文物春秋, 2: 17－23，76. 裴树文，冯兴无，陈福友, 高星. 2001. 三峡地区旧石器考古新进展. 见：邓涛、王原主编，第八届中国古脊椎动物学会学术年会论文集. 北京：海洋出报社， 197－208. 1. 高星，王惠民，裴树文，陈福友. 2013. 水洞沟－2003－2007年度考古发掘与研究报告. 北京：科学出版社，1－377. 2. 高星，裴树文. 2010. 三峡远古人类的足迹. 巴蜀书社, 1－180. 3. 卫奇，李珺，裴树文. 2009. 旧石器遗址与古人类文化. 见：袁宝印，夏正楷，牛平山主编，泥河湾裂谷与古人类. 北京：地质出版社，132－207. 1. 裴树文，陈福友. 2013. 水洞沟与“旧石器时代晚期革命”. 化石，2: 15－18. 2. 裴树文. 2011. 美国石器时代研究所（the Stone Age Institute）简介. 化石, 1: 10－12. 4. 裴树文. 2003. 宁夏旧石器考察记. 化石, 4: 38－40.